This page contains some general guidelines for making your Google Drive documents more accessible, with a link to more detailed information at the end. The University of Michigan also maintains a set of notes about Accessibility and Google Apps. its use is not recommended for sharing documents with images and/or tables. Users on a screen reader must activate screen reader support. Google Drive also provides keyboard commands for editing documents. 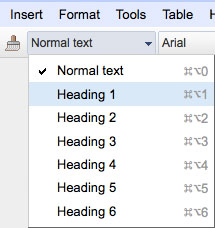 For long documents, use the Heading styles (Heading 1 through Heading 6) to break passages of text into multiple sections. All images, except those used for purely decorative purposes, should be accompanied by a caption or be described in the main text. Note: There is a mechanism for adding ALT text, but it may not work in all screen readers. Use one of the list tools to create lists, instead of inserting list items manually. Make sure that any hyperlink text clearly describes its target page. Sans-serif fonts are preferable to serif fonts with regard to on-screen legibility. If any text is given a colored "highlight," ensure that there is sufficient contrast between the highlight color and the text itself. A table of contents can help users navigate your document quickly, in addition to providing a preview of its content, both of which enhance its general usability. Because Google Drive is an application, the typical functions for navigating Web pages may not work. Specifically, Google Docs requires the activation of screen reader support by a user. Note: If a user cannot read a Google Doc file, it is possible for an editor to download the file as an accessible Microsoft Office file. A list of keyboard shortcuts for Google Docs editing commands is available from Google. Headings provide context for your document, and allow screen reader users to quickly recognize its major sections. A screen reader will not recognize bold text or a large font size as indicating a heading. to easily navigate your page. The document title should be in Heading 1, major subsections in Heading 2, further subsections in Heading 3, and so forth. 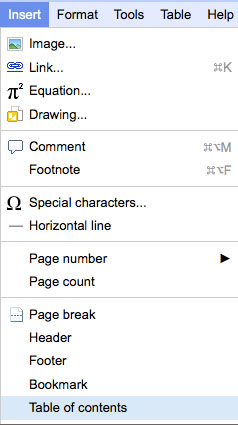 Designate headings in Google Docs by using the drop-down Styles menu. Upload and embed the image file. Click and highlight the image file. Go the main Format menu and select the Alt text.. option. Note: The ALT text tool is not available if you right click the image. In the next window, enter the ALT Text into the Description field. Note: Do not enter the ALT text into the Title field. Use one of the list tools to create either bulleted or numbered lists, instead of manually inserting bullets, numbers, asterisks or other symbols. As with headers, this tool enables screen readers to process list items more efficiently. Numbered lists with multiple levels should use a different numbering scheme on each level. For instance, if the topmost level uses "1, 2, 3," the next level should use "a, b, c."
Create a list in Google Docs by using one of the Insert List icons in the formatting toolbar. Screen reader users often scan a document for hyperlinks, so it is important to make sure your links make sense without their surrounding content. For example, a link should say "Readings for the week of February 14"
rather than "Readings for the week of February 14. Click here." Click the Insert Hyperlink icon to create a hyperlink in Google Docs. Sans-serif fonts are generally more legible than serif fonts, particularly on a monitor. Color schemes (text color vs. background color) should have enough contrast between light and dark. If too little contrast is provided, colorblind or low vision users may have difficulty reading the content. Certain color combinations (often those with bright colors) can even cause headaches for some users. in addition to making the file more generally usable by providing a preview of upcoming content. You must designate headings to generate a table of contents, as these are what is used to specify the sections of the document. Select Table of Contents from the drop-down Insert menu to create a table of contents in Google Docs.